Local point fume suction is the first choice when it comes to effectively protecting the health of employees in welding, cutting or similar work activities. 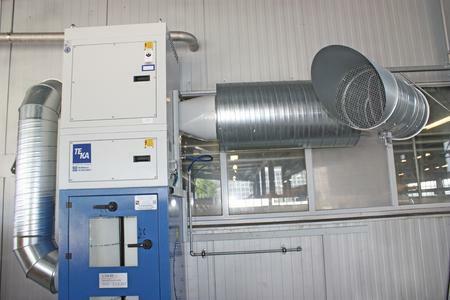 Stationary group fume suction, with which multiple workstations are categorised according to manufacturing or spatial aspects, thereby offers countless advantages as the example of the Swiss company IST Edelstahl Anlagenbau demonstrates. Founded 40 years ago, the plants, machine and pipeline construction company, which has 30 employees and is certified on many levels, builds plants, equipment and piping systems from stainless steel. Amongst others, its customers come from the food, machine and printing industries as well as the pharmaceutical and chemical industry. Its second mainstay is stationary aeroplane energy supply. Worldwide, IST offers the first integrated complete system for the power supply and the climate control of aeroplanes on the ground, the Aircraft Ground Energy System, in short AGES. For the traditional company, the number one priority is the expert and qualitatively high value processing of its products. Above all, clean production conditions, a modern production environment and highly qualified staff are a must in order to fulfil the high standards of quality, because: “In areas such as tank construction for the food and beverage industry, we must meet high testing requirements. Thereby, accuracy and cleanliness are in high demand “, explains managing director Kurt Zimmermann. Having the best possible occupational safety for its employees is of particular importance for IST. When welding and cutting components, dust and smoke are released in everyday production. This in turn can cause health problems and pollute the working environment. With the welding of high alloy steel in particular, there can be high concentrations of chromium trioxide, which have a carcinogenic effect. In order to adequately protect metal workers in the sector, IST has recently gone to new levels in putting its ventilation concept into practice in several sections. 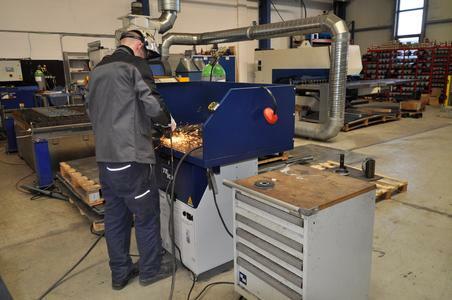 The task: Welders should be effectively protected from air emissions which arise from welding stainless steel in three separate hall areas, at a total of 15 workstations. An additional specification: The stations which are already spatially constrained in the production were not allowed to be limited any further. After receiving extensive advice from Rolf Lehmann, project manager of fume suction at LWB WeldTech AG from Flamatt, the company decided on a ventilation solution with suction straight from the source from the German manufacturer TEKA Absaug- und Entsorgungstechnologie. [Suction and Disposal Technology]. The suction systems of the FILTERCUBE variety installed at IST are suited to suction in multiple workstations for working with unalloyed materials, precious metals and galvanised material. They are certified by the Institute for Occupational Health and Safety of the German Social Accident Insurance, pursuant to the internationally recognised norm DIN (SN) EN ISO 15012-1 for the highest class of welding fumes separation “W3“. It claims that more than 99% of smoke and dust particles, even from high-alloyed steels are filtered out of the air. That is why the purified, warm process air is allowed to flow back into the workstation, according to an exemption clause of the Gefahrstoffverordnung, [Ordinance for Hazardous Substances] on which the Swiss accident insurance institution (SUVA) is based. Especially in winter, this saves energy costs. Due to the conditions on-site, stationary group suction, combined with accurate gathering of harmful substances at the point of origin, appears to present the best solution. After checking whether fewer substances and processes, which are hazardous to health, could be introduced, local point suction is the recommended first choice for protecting users. In case this is not yet adequate, employees should also obtain welding helmets with a supply of fresh air. With group fume suction, several workstations are categorised according to manufacturing or spatial aspects and form smaller suction units. A centralised suction and filter system collects and purifies the polluted air in a group. At IST, the workstations of the three areas are each focused on a group. The process in detail: The emissions released in welding are collected directly at the source using suction arms. The air containing harmful substances is lead through pipes to the suction and filtering system of the FILTERCUBE variety and is thereby purified. It is common for group solutions to offer several advantages compared to mobile suction systems for each workstation and centralised systems for the entire hall. While the former frequently takes up a lot of room within the production, the latter does not directly protect the individual welders in the workplace. However, the group suction offers even more benefits and proves to save on both costs and time. The investment costs are normally lower than they are with individually placed suction units or with a centralised system for air filtration in the halls. With regards their performance, the suction systems can be tailored exactly to the requirements of the individual workstations. Fewer pipes are needed than in a centralised system. Moreover, workstations along with filtering systems can be moved flexibly within production. By way of a summer/winter circuit, the purified, warm process air can either be led outside or returned to the hall. The latter reduces the heating costs in the winter. The dust particles are gathered in one place, making disposal easier. Likewise, the maintenance focuses on one point. This saves time. The concept of saving energy also plays a role in deciding on the system. In its construction, specialists from LWB WeldTech and TEKA have matched the system technology to the current requirements. For this, they have determined the actual capacity of the workstation and equipped the suction systems with a frequency inverter and a slide gate valve. This ensures that the volumetric flow rate is always tailored to the individual requirement, i.e. the number of welding stations which are actively used. The use of energy is hereby significantly reduced.